This page provide links to all available French Army Cards and rules for how to build a balanced French army. During the Napoleonic Era, the armies of Napoleon underwent drastic changes. 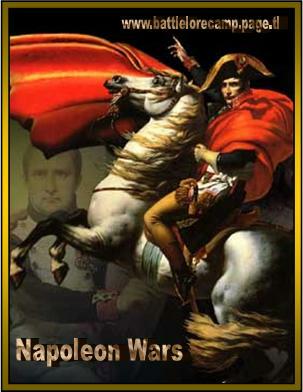 On one side, the result of all these wars were that Napoleon had a lot of veterans in his ranks. His Old Guard was on of the best fighting forces of the wold at that time, while French heavy cavalry (Carbiniers, Currasiers,…) packed a serious punch. Napoleon considered artillery to be vital to winning battles and so his armies were usually well-equiped with these powerfull weapons. At some points, the French army also had numerous Militia amongst its ranks. In times of great need (like after the Russian disaster), newly levied troops would be pressed into service without all the necessary training. Regiments of Young Gardes, for example, were Guards only in name at the time of the Battles of Quattre Bras, Ligny and Waterloo. However, the French usualy had a good mix of troops in their armies and they were well led also. Next to Napoleon himself, France had a corpse of highly skilled generals like Masséna, Ney, Murat, Lannes, ...who could lead France’s armies with great efficiency. units as there are other units in the army. · 1 unit in 5 may be guard/grenadier. This counts for all unit types. So if you have a total of 12 units, you may have up to 3 guard units. · France can have any War Council mix and all council members can be up to level 3. France is allowed to have 1 higher level of War Council than their opponents. -Spend 1 counter to reroll any complete dice roll for or against one of your infantry units. You must accept this second roll. against one of your infantry units.